Pastels houses, gorgeous Azulejo tile decorating the city in blues and whites on every street. The first bite of a pastel de nata, still warm from the oven, cinnamon and vanilla that lingers in your mouth. Lisbon, how truly lovely you are. 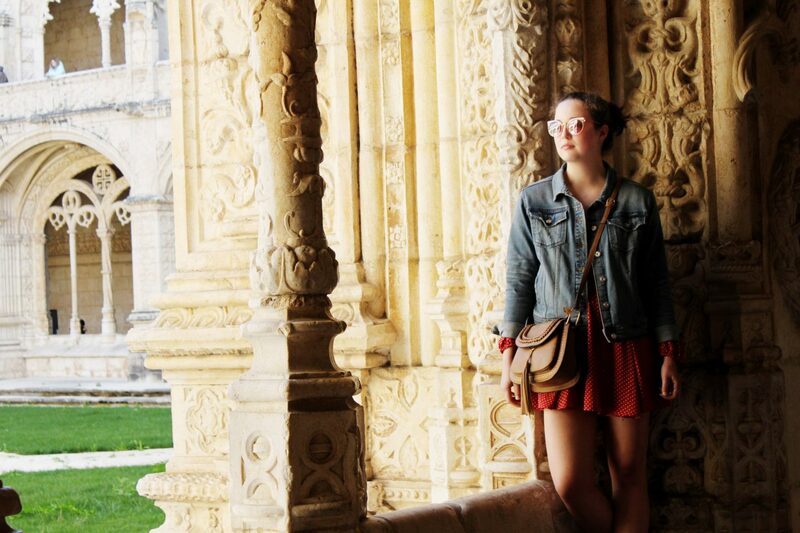 Three weekends ago my older sister and I boarded a plane for Portugal to discover the city for the first time. 48 whirlwind hours later I was already scheming to come back in October. 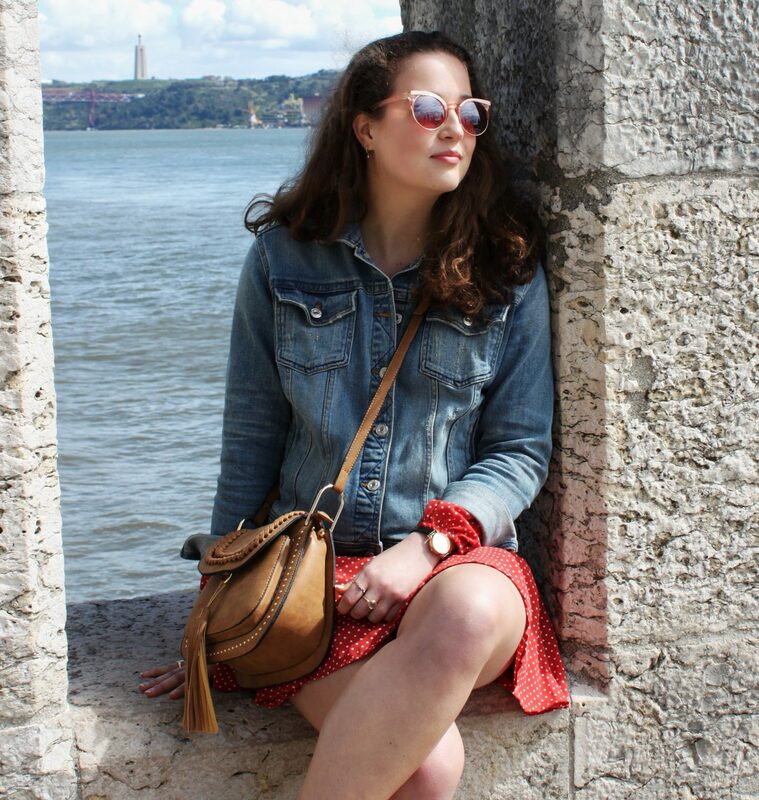 If you want to gallivant around, like a character holidaying in the Mediterranean in old films, look no further than Lisbon. Location is always my first priority when booking weekend trips, especially since you want to make the most of your time. We stayed in Liv’in in Lisbon Hostel, in a private room filled with bright light and easy Mediterranean minimalism. Breakfast was included andlike good university students we got our money’s worth, going back for thirds on the pancakes and nutella toast. Spent a good half of the time I was in Lisbon trying not to wipeout on the hills. Seriously steep hills, miniature mountains really. With tiled sidewalks. Any of you babes going to the beautiful city, for the love of all that is good do not wear heels. And this is from the gal who defines bravery as walking in heels on cobblestone! 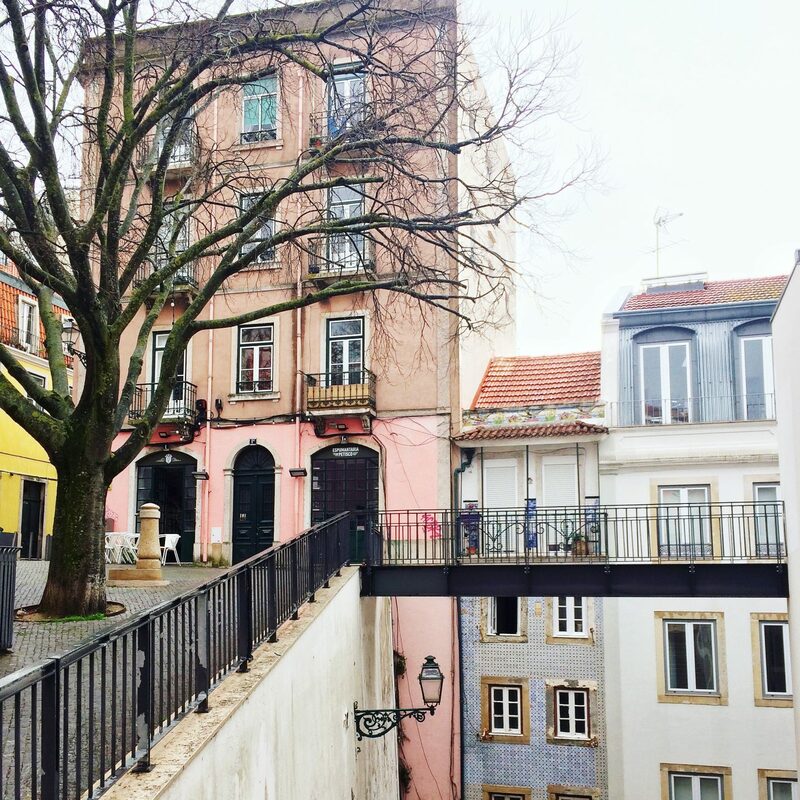 In the sunshine Lisbon is a Mediterranean dream, in the rain not so much. Dressing for the weather you want only works when the forecast is actually in your favor, as I discovered much to my chagrin. So definitely check before you only pack flirty sundresses and off the shoulder tops. Down the Avenida da Liberade from the hostel was Lisbon’s downtown. Terraces of pastel buildings and the yellow cable cars descending from the Castelo São Jorge towards the waterfront. To the east is the Museu Nacional do Azulejo, rooms decorated floor to ceiling in the blue and white of Portugal’s celebrated tile. Aside from the absurdly delicious food, this was my favorite part of the entire trip. West of city center is Belém, home to world famous custard tarts and UNESCO architecture. 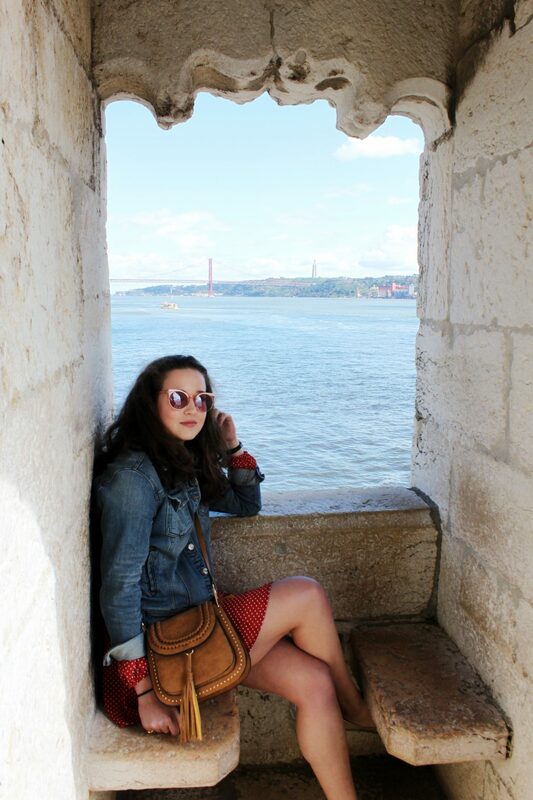 On a clear sunny day, climb the Torre de Belem to look out over the river Tagus. (Note: Wear skirts at your own risk, or have a bit of a Marilyn moment like yours truly). To refuel after all of those spiral stairs, we popped over to the Pasteis de Belém. 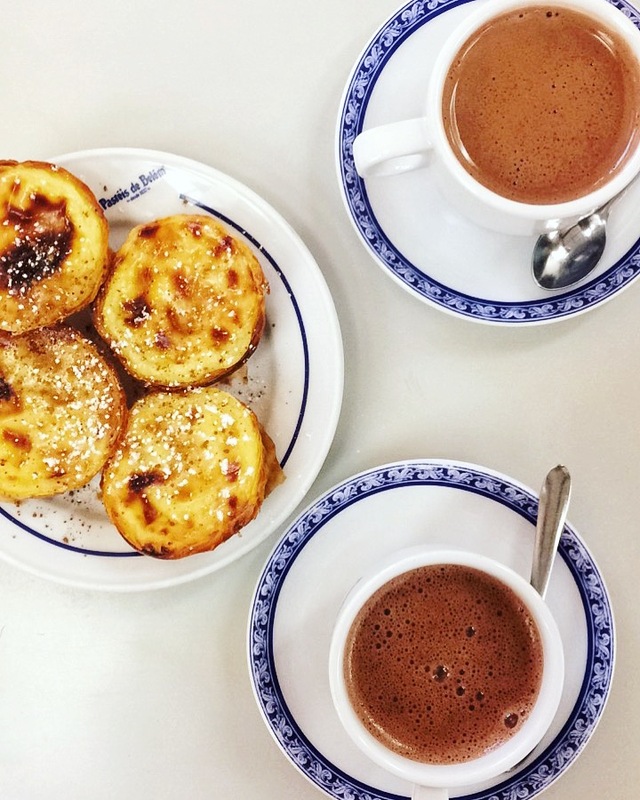 This place is no lie, they have pastel de nata down to a fine art, best served with some truly luxurious hot chocolate. 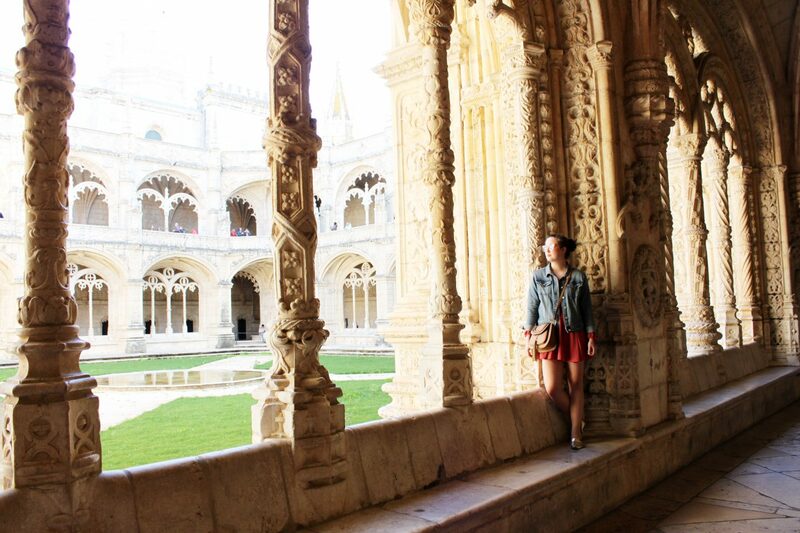 For more gorgeous architecture and a bit of history, the Mosteiro dos Jerónimos is just down the street and not to be missed. Walking through its limestone halls, I felt instantly transported back in time.